2009 has been designated "The International Year of Astronomy." To honour this title the Austrian Mint in Vienna has chosen to dedicate its silver-niobium coin this year to this fascinating theme. The new coin, which goes on sale on 11th March, 2009, displays a three-quarter portrait of the famous mathematician and astronomer Galileo Galilei (1564-1642) and his telescope with which he observed the surface of the moon just four hundred years ago in 1609. In the background his drawing of the moon surface is reproduced, while the silver ring spans the development of the telescope from Newton’s telescope through the observatory in Kremsmünster (Upper Austria) to radio telescopes and those launched into space – a far cry from Galileo’s first views of the moon. 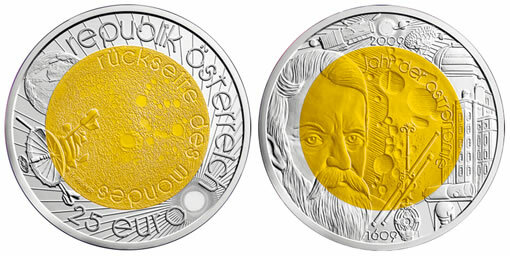 The official side of the coin with the face value and legend "Republik Österreich" shows the dark side of the moon that Galileo could not observe. A satellite is shown orbiting the moon and surveying its surface. In the ring one sees the planet Earth partly covered by the moon and below a stylised Sun radiates the heavens. The niobium pill this year is a golden yellow, which provides an excellent surface for the detailed design of the coin. The Austrian Mint was the first to employ this modern metal (discovered in 1801) in commemorative coins, changing its colour each year. The 25 Euro silver-niobium coin has proven to be one of the most popular of all issues, anxiously awaited by coin collectors and connoisseurs alike. The new coin is struck in special uncirculated quality to a maximum mintage of 65,000 pieces. Each coin comes in an attractive box with a numbered certificate of authenticity. The first day of issue is 11th March, 2009. The pre-orders indicate a heavy demand for the coin and an excellent chance of repeating the sell-out of previous issues. The special uncirculated quality coins may be ordered through the Austrian Mint website. The Mint is the source for all Austrian Euro and Cent coins, whether they are intended for shopping, as an investment or for collection. Before the Euro, the Schilling and Groschen coins were minted, and before that – during the monarchy – Crowns, Guilders and Ducats were struck by the Austrian Mint. Now I wonder why the U.S. hasn’t minted their own IYA commemorative coin. It’s such a shame.